Today I bought the Korean Chili Powder needed to make Kim-Chi. So now you have something to look forward to. The other thing I did today? 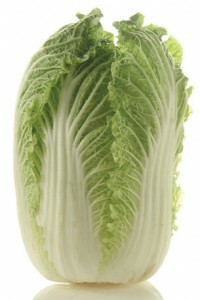 I used the other half of the GINORMOUS head of Chinese cabbage to make my version of Bubbles and Squeak. Bubbles and Squeak is a British dish made with potatoes, cabbage and sometimes other stuff. Mine is more like hash browns with cabbage, and it's pretty easy, as long as you don't skip the squeezing step. So maybe I should call it Bubbles and Squeeze. Add the potatoes to a bowl and mix in the cabbage and the seasoning. While you're squeezing the spuds, preheat a frying pan with some canola oil over medium heat. Once the pan is hot add the potato and cabbage mixture, and spread evenly over the surface of the pan, and press down. Now, leave it. Just let it sit on the heat for about 3-4 minutes. Then stir, press and leave for another 3 minutes. Repeat one more time. After you've let it sit, then stirred, 3 times, flip it. I know it's really hard to flip the whole thing. I don't even try. I take my spatula and flip in sections, then I press it out evenly again, let it sit for another 3 - 4 minutes. At this point, you should have a giant potato pancake that is crispy on both sides and tender in the middle. This afternoon I picked up pork cutlets from Richardson Farms at the Triangle Farmer's Market and served the Bubbles and Squeeze with pork, applesauce and fried green tomatoes (we had green tomatoes in last week's farm share). You can also add finely diced onions to the mixture, and serve with any number of sausages or sausage like products. It's also good with cheese melted over the top, and a fried egg, or you know, nothing at all. Simple food, simple preparation, and a good, new use for an old standard leafy green. Enjoy! Yummm! Wonder if my kids will eat it? Sounds tasty, and for the "carnivore" version, fry bacon while you are squeezin' the devil outta them taters. Fry the bacon quite crisp, crumble it, add it to the taters and cabbage, add no more salt, but season to taste. Follow the rest of the directions. oops...fry in the bacon fat. I said it was the carnivore version didn't I?